Did you know that Virginia is for Racing Lovers? 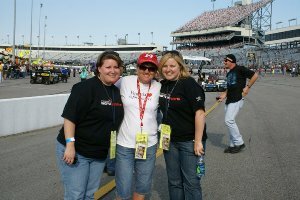 Have you ever been to a NASCAR race? It’s thrilling and one of the best experiences that I have had! I went to the night race this past April at Richmond Raceway. A pit pass allowed me to be in the middle of it all while watching the preparations by the different crews. It was relatively quiet in the pits. Two hours later, I was covering my ears as the cars passed at more than 100 miles per hour. My friends told me about the pace, the noise, the fans, the experience … but it’s one that you can’t describe until you’re there! These drivers are athletes. They race at crazy speeds with all these other factors surrounding them. They sit in the same position for more than four to six hours at a time while risking their lives for our entertainment. My favorite athlete, I mean, driver, is Denny Hamlin. He stands for something both on the track and off, and was born right here in Virginia! The state itself has many contributors to NASCAR history. Virginia is the only state that hosts 4 NASCAR races each year. Virginia is home to Martinsville Speedway, which was actually founded in 1947, one year before NASCAR. Remember Trevor Bayne, the youngest winner ever, from this year’s Daytona 500? He drives for Wood Brothers Racing, a sixty year-old family organization founded and based in Virginia for fifty-three years, the oldest continuously operating NASCAR Cup Series team. So at the end of the day, Virginia is for Racing Lovers. Seriously. No kidding. Between Richmond, Martinsville, and the NASCAR history that abounds, the experiences are unequaled. This weekend I will be cheering for Denny Hamlin at Bristol Motor Speedway. It’s the IRWIN Tools Night Race but I hope that my experience isn’t a race at all. Don’t forget… there’s also Virginia International Raceway (VIR) right down the road. A beautiful resort with a pretty packed schedule, check them out!